RUNNYMEDE ROYALS PICKLEBALL CLUB | Lightwater, Surrey - Sunningdale, Berks - Camberley, Surrey. The club was formed when, in November 2014, four ex-members of the long-departed (but sorely missed!) sports, leisure and social venue, The Runnymede Club, Egham, Surrey started to play pickleball while on a cricket tour in Mallorca. In the new year they began playing regularly at Lightwater, Surrey. The player base has expanded since that time and due to demand now hosts a number of different sessions per week; Lightwater, Surrey, Sunningdale, Berks and Camberley, Surrey and soon an additional outdoor venue at Windlesham, Surrey. 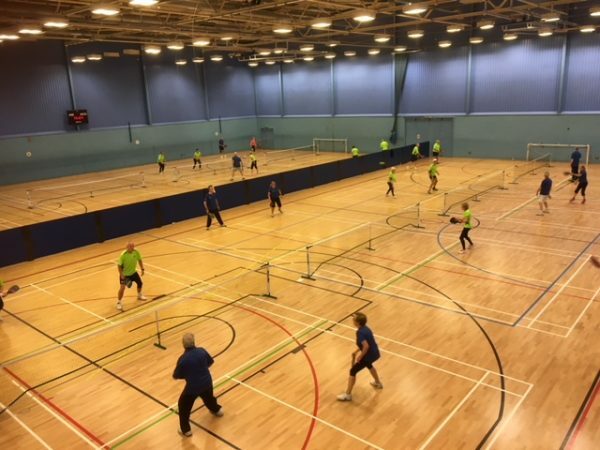 RRPC has become a progressive and well-regarded entity within the UK pickleball scene with a membership of well over 100 players. Our members regularly visit other groups wishing to set up clubs, offering advice, instruction and support. This has even involved overseas projects. The Club plays inter-club matches, organises tours and several of our members regularly enter National and International tournaments. Social events are also included in the Club’s calendar. The Club welcomes new members from the age of 18+ and of all abilities. It is also pleased to receive visits from players from other countries or other areas of the UK. Please phone or email us beforehand if you would like to attend one of our club sessions. Coaches and pros say it’s important to watch others to be a better player. We think the following link shows the best pickleball point ever made. It has everything you want to see on the court – fast, slow, offense and defence. What do you think? Watch this point now and be inspired to add something new to your game!